As far as auto racing is concerned, Dale Earnhardt Jr. has distinguished himself as one of the best racers of all time. Coming from a lineage of successful racing stars, Dale has won several racing championships since the inception of his career and has placed his name in the books of history. He began his professional career in 1999 and has spent over two decades behind the wheel with lots of accomplishments. Interestingly, the outstanding car racer clinched 26 wins as well as 260 top-10 finishes and 15 poles throughout his career. He announced his retirement from professional racing in 2017 and is currently working as an analyst for the NASCAR on NBC. Learn more about Dale below. Who is Dale Earnhardt Jr? Ralph Dale Earnhardt Jr. is a former American professional car racer, team owner as well as a media personality. He is notable for being the son of the former racing legend Dale Earnhardt Sr. and the grandson of Ralph Earnhardt who was also a professional car racer. Dale first came into this world on the 10th day of October 1974 and was born in Kannapolis City of North Carolina in the United States. His parents Brenda Lorraine and Earnhardt Sr. divorced shortly after he was born. As a result, Dale and his sister Kelley Earnhardt were raised by their mother. Growing up, life became difficult for Dale and his family as his mother did lots of odd jobs to make ends meet. As a result of persistent hardship, his mother lost custody of them to their father who had gotten married for a second time. Staying with their father, Dale and his sister attended a military school; he also graduated from Mitchell Community College. Afterward, Dale went to Andy Hillenburg’s driving school and eventually began his racing career when he turned 17. At the early stages of his amateur career, Dale featured in several local racing competitions including Busch Series and Winston Cup series. Turning pro, Dale participated in the 1996 Carolina Pride and recorded his first win at the 1998 NASCAR Busch Series. He continued making strides throughout his professional career which lasted for over two decades. Dale featured in various racing competitions including Daytona 500, Pepsi 400, and NASCAR Series Championships, among others. He competed against top racers including Dale Jarrett, Kurt Busch, Jimmie Johnson, Casey Mears, Bill Elliott, and Kevin Harvick, etc. During his professional career, Dale Earnhardt Jr. had a record of 26 wins as well as 260 top-10 finishes and 15 poles. He retired from full-time racing in 2017 and has been making occasional appearances at the NASCAR Xfinity Series to date. He also works as an analyst for NASCAR at the NBC Network. The amazing racer has made a fortune from his car racing career and is regarded as one of the richest NASCAR drivers in history. He is equally one of the richest and most successful athletes of all time. 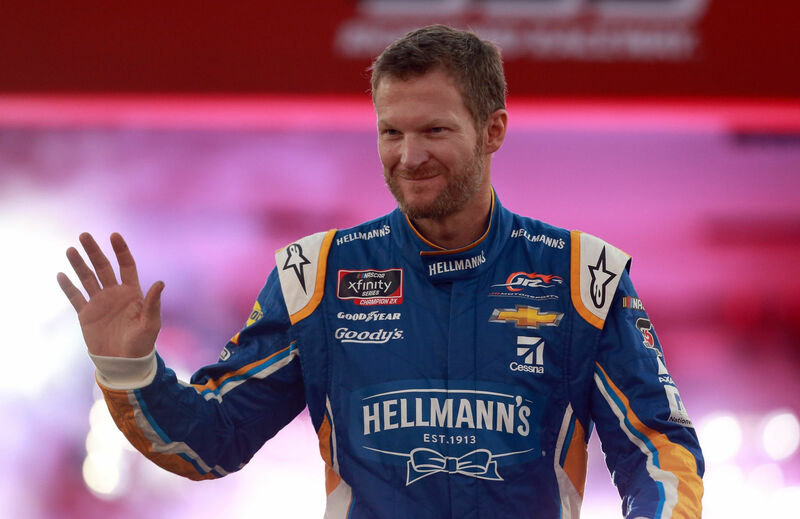 Dale Earnhardt Jr. currently has a staggering net worth of $400 million. He made his wealth from his racing career, merchandising, and endorsements as well as other business endeavors. Additionally, he has signed endorsement deals with notable brands such as Monster Energy, Hendrick Motorsport, Chevrolet, TaxSlayer, and Nationwide. While Dale has garnered fame with his excellent racing skills, he is equally successful in his love life. The stunt driver is happily married to his longtime girlfriend named Amy Reimann. Amy is a renowned American interior designer and the former spouse of Tommy Cook. Born on the 25th day of March 1982; Amy obtained her bachelor’s degree in interior design from the University of Kentucky. She got hitched to the Kentucky football team’s defensive line instructor Tommy Cook in 2008. However, their short-lived marriage ended a few months after their wedding. The following year, Amy and Dale met each other and seeing the connection between them, the duo decided to set their relationship sailing. After six years of successful relationship, the couple announced their engagement in June 2015. After that, they walked down the aisle on New Year’s Eve of 2016 and their wedding took place at the Richard Childress Vineyards situated in Lexington, North Carolina. The amazing couple welcomed their first child, a daughter named Isla Rose Earnhardt on 30th April 2018. They have been enjoying a blissful marriage and there is no sign of marital issues between them. Check Out: Jack Nicklaus Net Worth, Children, and Grand Children, How Old is He? Wondering if Dale Earnhardt Jr. is dead or alive? Well, the talented racing champion is still very much alive and not dead. However, he lost his father Dale Earnhardt Sr. in an accident during the Daytona 500 final racing competition held on 18th February 2001. During the event, his father Earnhardt Sr. was involved in an auto crash after a co-racer Sterling Marlin made contact with his left rear bumper in turn four. This caused a wreck that damaged his basilar skull in the process. Sadly, all efforts to keep him alive weren’t successful and he died a few hours later. Earnhardt Sr. was one of the prolific drivers in NASCAR history; he clinched over 76 wins at the Winston Cup races. Since his death, Dale has devoted his racing career to honoring and keeping his father’s legacy alive. Additionally, Dale Earnhardt Sr. got enrolled into NASCAR Hall of Fame in 2010.